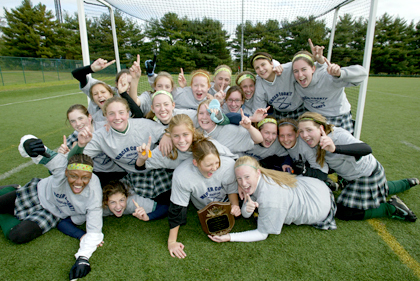 TARTAN PRIDE: Members of the Stuart Country Day field hockey squad celebrate after toppling previously undefeated Allentown 2-1 last Saturday in the Mercer County Tournament (MCT) final. The Tartans had fallen to Allentown in the last two MCT title games. It was the first outright MCT championship in school history. For more on the game, see page 46. With questions on relocation still open-ended as the Princetons and the Regional Planning Board all consider how to re-zone the main University Medical Center at Princeton campus on Witherspoon Street, the hospital must now start considering the cost of any delay in its quest to relocate to a new campus outside Princeton. Hundreds of residents, elected officials, municipal staff, appointees, and volunteers gathered at the Princeton University Chapel Thursday to remember Borough Mayor Joseph O'Neill as an "innovative" and "far-seeking educator." HiTOPS, Inc., Princeton's teen health and education center, announced on Tuesday that it has reached the halfway mark in its $2 million endowment campaign to expand the facilities, programming, and clientele at its home on Wiggins Street.